I miss the days when movies were great. I don’t see this much anymore. There are some good films, even a few great ones, but most of the extraordinary entertainment is now in the former of TV series. Breaking Bad, The Walking Dead etc. These TV shows are now in the mainstream and doing great. If you think about it, when you watch these shows it is like watching a really long movie. You have seasons, which have anywhere from 12 to 16 episodes each, more or less. Creators can do more with this than a short two and a half hour movie--and let me tell you, two and a half hours is pretty darn long for a movie compared to the old days when they were on average an hour and fifteen minutes. Personally I feel talent and some hard work trumps technicality. You can have a beautifully written story, grammar perfect, syntax on spot, but if your voice and content lack then it's useless to a reader looking to get into the world you are creating. I had gone through this on Ipublish and other sites where others boasted about what they accomplished and where they've gone to school and such. And that's fine. Confidence is wonderful. But when you get down to it, their bark was bigger than their bite. Sure they appeared to put down eloquent sentences and such, but their story content lacked--or at least wasn't on the league with which they judged others. Of course, that site was a free-for-all where writers were unfairly pulling down other writers with fake reviews and such, but you get the point. Fancy education and knowledge of the finer points are excellent and help a lot, but if you don't have the talent then it doesn't matter. Here cooking and listening to Christmas music, and of course writing. At least for the site. I know I see readers from other countries visiting the blog, and thank you all for stopping by. What do you celebrate in your country? I'd like to meet on in the comments, along with any stories like if you're cooking, or going to someone's house. Are you writing? Thinking about any story ideas? 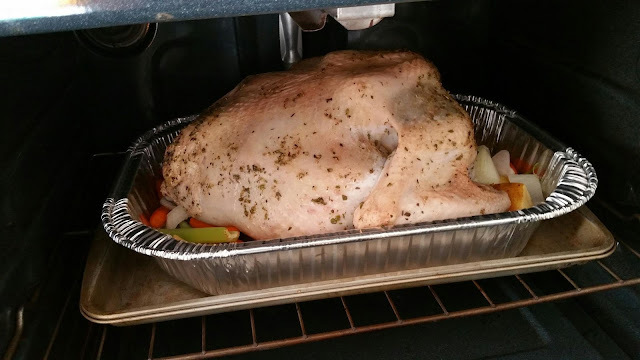 I'm cooking, so as this bird roasts I'm in this boiling kitchen writing down some thoughts. I'm about to open a window or something, because it's getting pretty toasty in here with the oven and all. It's not easy to incorporate your writing into your daily routine, but it is possible. Tomorrow I have to work, but it's gonna be a dead day. I'll be bringing my writing and working on that in the spare time. I'll be at a cafe before I go in and then editing during the day. Oh and probably checking out the shopping deals for Black Friday online,too. So here I am sitting in a cafe with a short story I'm finishing up to submit. I have been feeling sick, probably the change in weather. But I'm thinking about how I haven't been writing for the past few days and I start to worry. It's like driving, you start again and remember the mechanics naturally, but there is always that self-doubt just before where you have to jump in. So I listened to my recent post about Music and started editing and got right back into it. Feels good when you pick up and things naturally come together. All the worry and fear dissolves and you see the goal clearly in front of you. I say you have to just pick up and get to it. Don't think of anything else, just start and see how you feel. I bet you'll see it just comes naturally. Tomorrow is Thanksgiving so probably won't be able to get much writing in, but I'll try. Maybe read between cooking and straightening up. I was once in a slump; some might say writers block, but that's hogwash. A friend from work suggested a movie about positive thinking that might help. I had always known about the power of the subconscious mind, but it's always helpful to be reminded every now and again—a refresher. So I watched the first half of this movie during lunch and then the rest on my way to work one morning. The very interesting and motivational movie The Secret, which is a best selling self help book turned movie, is about a secret that has been passed down from long time ago on how to get anything you want through directed thinking. It's based off the law of attraction. You put your thoughts out to the universe and eventually get what you ask for. You can be of any religion to do it. Positive thinking. They say you make real that which you think—sound familiar? Haven’t been on, busy at work and trying to finish off this short story to get out there. On top of that I’ve been editing the first few chapters of my first novel as many chances as I get. Time just hasn’t been my friend. But I’m going to make time my friend, because these things need to get done. I’m trying to get more people on here who need help and inspiration. We can all work together and help each other. Like-minded individuals who you can toss ideas off of and get honest feedback. It will come together. I was reading about this writer who had published work and something happened where he was back to square one. So he started a blog. For a year he had no views. And then things started picking up. He started inviting other writers on and his blog started to take off. Even published some more books after as well. Sometimes a story cannot just be linear. Certain times it can, yes; there are always exceptions. But you run the risk of being boring if it is used a lot. A different perspective can show the reader a different point of view and a new understanding of what the main character of the scene is portrayed as, or things you wouldn't see from the POV of that character. Two parents may be talking about something that makes sense to adults, but a child who has snuck down to the dining room to listen is going to hear and see the situation totally different. We all want our writing to take off and make tons of money--fame. Some lie and say they are only doing it for the art of it. Some really are doing it for just the art, and for themselves. But most writers are trying to do it so it's their sole means of money and they can actually love their day job instead of building someone else’s dreams. If you get paid for writing, enough to actually live off of it and pay the bills, you are one of the lucky ones; though luck isn’t all there is to it. The ones who made it happen didn’t quit and stuck it out through many rejections and put their soul out naked for all to see. And now they can sustain their dream. You can be the boss, too, doing something you love. Yes there are aggravating times, as with any job, but if you love writing then you aren’t really working--you know, and all the other sayings that go with this statement. I haven’t been on for a bit because I have been feeling sick. Change in the weather moving into a new season, a colder season, and wham, you’re sick. And this can make you go into different frames of mind. Of course it may not be that you’re sick, you can just be feeling blue. You may feel depressed or like you can’t go on, that your best had been spent in your last story. This is a dangerous way to think and can destroy you if you aren’t ready for it. You have to keep moving. Sometimes I feel this way, where everything feels like it’s coming down on me. I think about everything at once. You don’t have talent, who would read anything you write? Sound familiar? I feel talentless when things don’t come to me, ideas. I say what if I put out one story and can’t come up with anymore after this. These are irrational thoughts. Of course more ideas will come to you. If you let them, if you open up and daydream and enter that state of mind where you can create.